I welcome custom orders: shirts, pants, moccasins, gun cases. I like to discuss the project thoroughly with the customer before starting. We will talk about design details, type and color of leather, measurements, etc. In all my work I strive for perfection, settle for nothing less than excellence. If I don't feel I'm equipped to provide you with a superior product, I'll refer you to another artist. Please feel free to contact me to discuss your custom project, large or small. 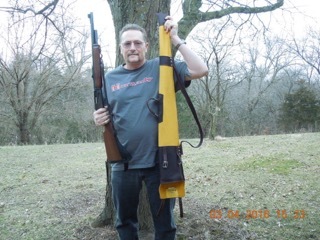 Rick needed a case for his 45-70 Lever Action Guide Gun. 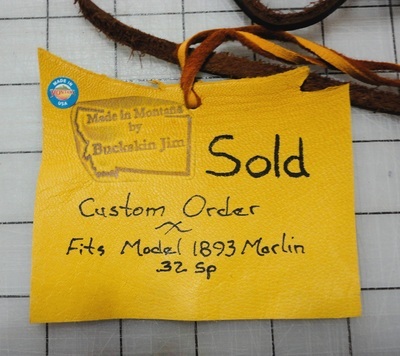 He and I worked together to design this Buffalo Hide and Elkskin case with all the features he wants:buckle closure, sling, and ammo pocket. Mike has a nice 1893 Marlin in .32 Win.Sp. that he intends to take on a horseback hunt this fall. 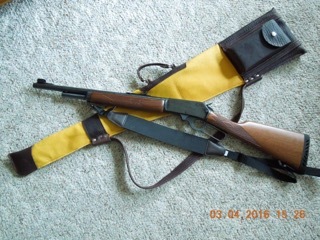 I made this custom buckskin case to fit the rifle and its vintage sling. 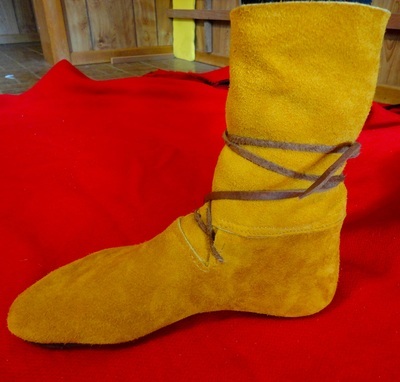 I recently made a pair of hunting moccasins for John, who wants to move quietly through the woods this hunting season. Good luck this fall, John . . . .hope you get your elk! 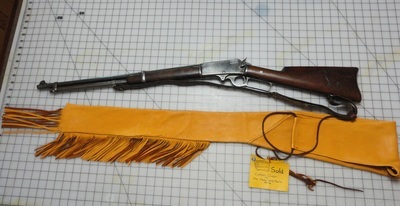 Step 1: Stretching a commercially tanned elkskin by wetting it, then tacking it up to dry. 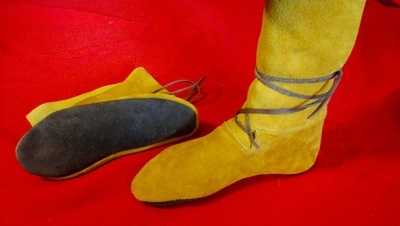 Stretching is not absolutely necessary, but it helps stabilize the leather and results in a superior quality moccasin. Step 2: While the elkskin is drying, I cut a pattern based on tracing and measurements of John's foot. Step 3: I cut pieces for the elkskin uppers, using the thickest part of the hide around the foot and thinner, more supple parts for the tongue and boot top. Step 4: I cut the right and left soles from buffalo hide. Step 5: The moccasins are sewn, wrong-side-out and then turned. 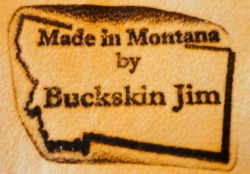 Step 6: The hand-cut laces are added and, after a final quality check, the moccasins are branded "Made in Montana by Buckskin Jim."